There are no direct flights to Galapagos. Whether you’re traveling from the United States, Europe or anywhere else, you should book an international flight to Guayaquil or Quito, the capital of Ecuador. Here’s the reason: As Galapagos is a protected National Park, there are some regulations that airlines shall fulfill. It’s unlikely that there will ever be an international flight to the Galapagos. Major cities of Central and South America. Many major cities in Central and South America. The Mariscal Sucre International airport is located on the town of Tababela about 11 miles east of Quito. Flying from Quito to Galapagos takes around two and a half hours. Most of the flights make a stop in Guayaquil. The Mariscal Sucre Airport is the busiest airport in Ecuador and one of the busiest in South America. If possible spare a day or two in Quito one of the finest capitals in the world, visit the middle of the world and the colonial part of town, and discover why Quito has won the World Travel Awards for various consecutive years. 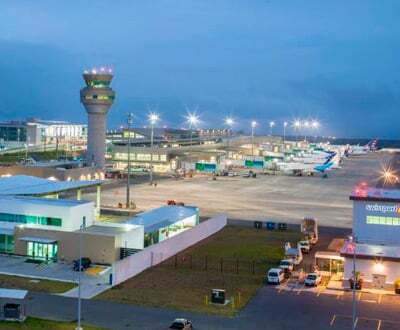 The José Joaquín de Olmedo airport is located on the Avenida de las Americas, on the north of Guayaquil. Flying from Guayaquil to Galapagos takes around one and a half hours, all of the flights are direct flights. 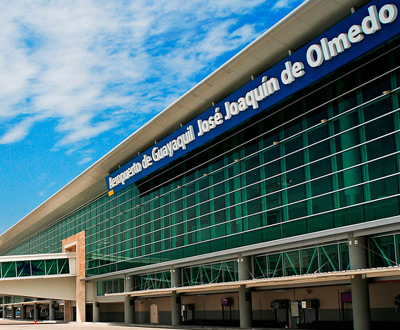 José Joaquín de Olmedo International Airport was named “Best Airport in Latin America" for two consecutive years by the Airports Council International (2008-2009). It receives and departs daily flights from and to the United States; Europe, South America; Central America. There are daily flights to the archipelago. You can land on Baltra Island or in Puerto Baquerizo Moreno on San Cristobal Island, departing from Quito, or Guayaquil. 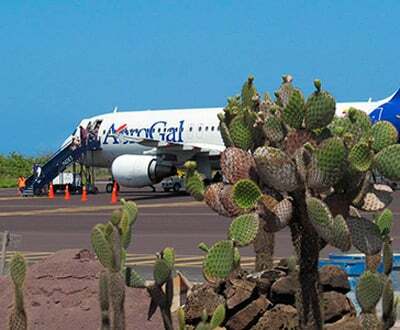 It is recommended to arrive at least one day prior to the Galapagos flight in the case of any delay or cancellation. Booking the cruise and the flight together is a better option as cruises often work with specific flights. Consider booking your flights with GalapagosIslands.com. We will make sure that you take the appropriate flight and back you up if there is any complication or delay on your Galapagos flight. Stopovers in Guayaquil last approximately 50 minutes. • If you book your flight when reserving your Galapagos cruise, you can often save big. For free help planning the cruise+flight package right for you, contact us now. • All flights to the Galapagos Islands start from the mainland Ecuador (Quito or Guayaquil). There are currently no direct international flights to Galapagos. • Make sure you coordinate your flights to Galapagos with your Galapagos tour. There are 2 main airports in Galapagos. Cruises and tours start from different islands on different days. • 1 free round trip flight Free Quito - Galapagos roundtrip flight with the purchase of a luxury cruise Inquire now! *(Applied to published rack rates only, and cannot be combined with other promotions or discounts). • Free round trip flight Quito - Galapagos - Quito when booking an 8-day cruise for 2 people on any of our First Class Vessel. Inquire now!